Sorry this is a little late this Friday; I was traveling this morning and didn’t have a chance to get it up earlier. Anyway, it’s rivalry week. Ross and I both had decent weeks last week in the pre-Rivalry week snoozefest. Ross churned out an impressive 9-2 outright and 8-3 ATS mark, while I kept my hover near .500 mantra going with a 6-4 outright and 5-5 ATS. That brings my season records to 68-38 outright and 45-60-1 ATS. Ross is making a late season surge to try and catch me with respective records of 62-38 and 31-67-2. I’m really hoping that I get the opportunity to put this up before this game starts, but I promise you all that I’m writing this at 10:09 A.M. CST this morning. The winner of this game is going to want to go back to their locker room and promptly change into all of the Stanford gear they can get and check the final score (or watch the end of the game). Should Stanford upset UCLA, the winner of this game wins the Pac-12 South and the right to face Oregon for the Pac-12 title. If UCLA wins however, then the Bruins get a rematch with Oregon. Both of these teams have dynamic offenses. I wrote last week about Arizona’s impressive receiving corps and the quarterback play of Anu Solomon. Something that I may have overlooked though is the running game led by Nick Wilson and Terris Jones-Grigsby. 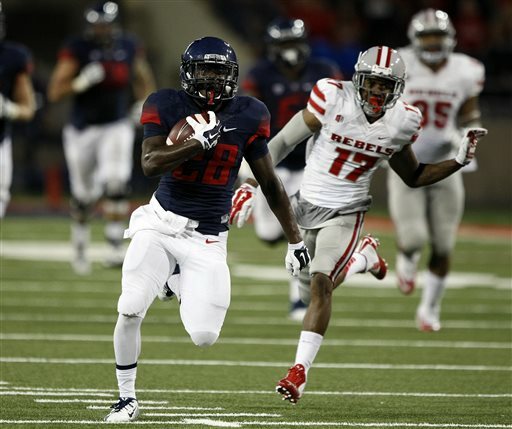 Arizona has a balanced attack and can put up loads of points on the ground or through the air. Taylor Kelly and the Sun Devils are no slouches either though. They have two explosive playmakers in D.J. Foster and Jaelen Strong. The key in this one is getting a few stops or turnovers. Whoever can manage to do that will win the game. This is a huge game for the state of Arizona. This is the first time these two teams have played each other and both been ranked since 1986. It is also only the second time ever that they have met with both teams having 9 wins. The other was 1975. Anu Solomon is a game time decision after suffering an ankle injury, but this is one of those games where you play no matter what. The game is in Tucson which gives the Wildcats a slight edge. Vegas odds-makers literally have this game as a tossup. The key for me will be if Solomon can play or not. In an intense rivalry game with this much on the line (a potential trip to one of the College Football Playoff’s New Year’s Day bowls), I don’t see how there is any way he doesn’t play. The fact that this game is at home should make him and fellow freshman running back Nick Wilson, who oh by the way has rushed for over 1,000 yards, comfortable in a pressure packed environment. I like the Wildcats 35-31. Clean, old-fashioned hate is the title ascribed to this game. A couple of Tech punks (umm, I mean students) managed to make their way over to Athens and vandalize the famous Georgia arch earlier this week, thus escalating some of that hate. Georgia has played very well since the Florida debacle. 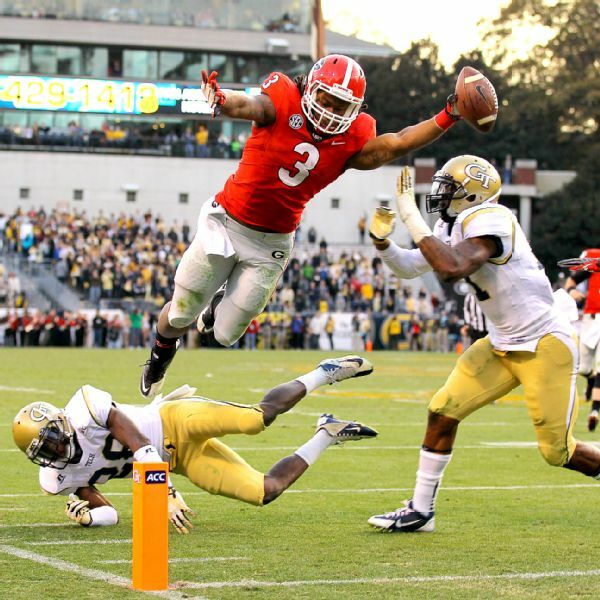 The loss of Todd Gurley hurts, and this will be Georgia’s first game against an FBS opponent since the loss of Gurley. Georgia Tech’s offense is frequently a source of headache for opposing coaches. It is an ancient relic that’s been dusted off and polished to work like a well-oiled machine. Justin Thomas is an ideal fit for Paul Johnson’s system and has garnered high praise from his head coach. Jeremy Pruitt will have another tall task this week in figuring out ways to slow this thing down. The key for the UGA defense is the same as it would be for anyone playing an option offense: be disciplined, read your keys, and stay at home. For Georgia offensively, they are going to want to possess the ball and work that time of possession. Heavy running attacks thrive on the ability to wear down defenses. Mike Bobo and Hutson Mason surely know this, and need to be focusing on keeping the ball in their hands rather than with Thomas and the Jackets offense. The Rambling Wreck can run the football. And I mean really run the football. Paul Johnson’s triple option attack isn’t the most exciting offense to watch (except for me because I love watching the option run well). 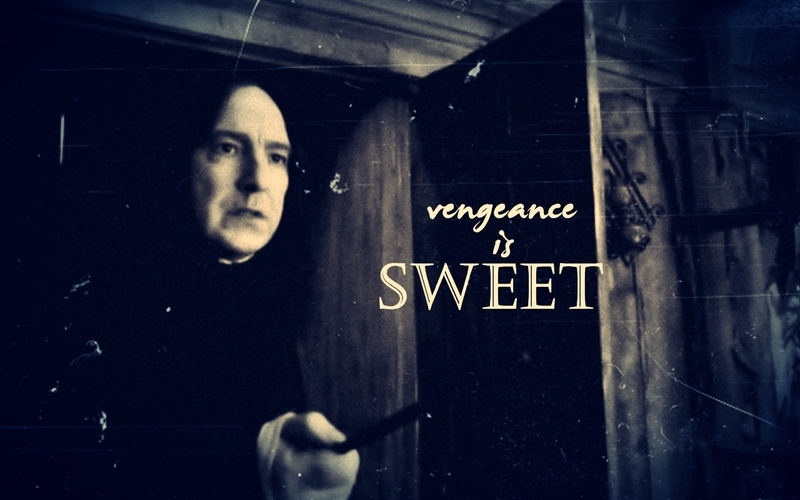 But they will pound you all day long and establish long, time-consuming drives that tire out defenses. The Dawgs can also pound the rock, but in a completely different way. The excitement of having Todd Gurley back quickly ended when he tore his ACL. It’s an unfortunate injury as he would have been part of the best two-headed monster backfield in the country. The good news for Georgia fans is Nick Chubb is still there to set freshman rushing record books ablaze Between the Hedges. Home game for Georgia. Enough rushing yards to circle the globe. The difference for me is the athleticism of the Georgia defense which has really played well the past few weeks. I like Georgia 31-21. 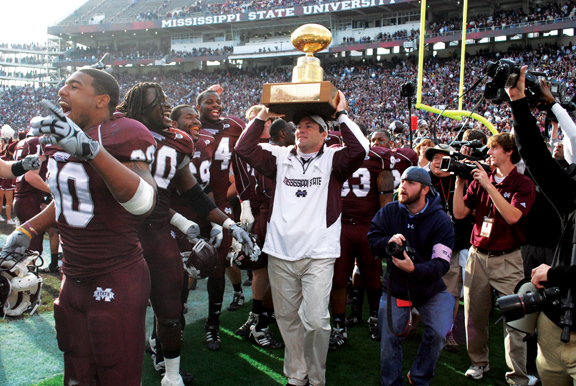 The Egg Bowl has lost some of the luster it may have had a few weeks ago, but it is still a big game for both teams. Ole Miss’ loss to Arkansas last week officially eliminated them from West contention, but they can play spoiler to arch rival Mississippi State this weekend. This is also Bo Wallace’s going away party in Vaught-Hemingway. I know you Rebel fans can sometimes have mixed feelings about Broadway Bo, but he has been your starter for three years and has by and large done a good job. The aforementioned Wallace is probably the biggest key to the game. Bo got hurt early in the Arkansas game and came back and looked clearly affected by the injury. He threw a few picks and the Rebels’ offense was blanked by the Big Nastys from Fayetteville. Wallace needs to get going early and needs some protection from the fierce State pass rush. For Mississippi State, they need to establish the running game, both with Dak Prescott and Josh Robinson. Prescott has improved, but he still isn’t a phenomenal down-the-field passer. Ole Miss has one of the best, and most opportunistic, pass defenses. The Bulldogs need to force the Ole Miss defense to commit to the run to open the field up for receivers Jameon Lewis and De’Runnya Wilson. The “Kick Six” was a fiasco for Alabama. You not only lose to your biggest rival, but you also lost the division and the opportunity for the first back-to-back conference titles in a long time and the first national champion 3-peat since the 1934-36 Minnesota Golden Gophers. Auburn is coming into the game like Janis Joplin and Bobby McGee “nothing left to lose.” That should be scary for Alabama fans. An Auburn team playing loose and free is what did Alabama in last year. Auburn has struggled in recent weeks, but the offense that struck terror in the hearts of all SEC defensive coordinators still exists. The key for Auburn is to get back on track, and get back to doing the things that they were doing well before the Texas A&M game. Alabama’s key to victory is to contain Nick Marshall. It’s ok if Sammy Coates or Duke Williams comes up with one deep ball. It’s ok if Cameron Artis-Payne has 100 yards rushing. It’s even ok if Corey Grant has a big run or two. What Alabama can’t have happen is for Nick Marshall to gash them on the ground, continuously extend plays and find receivers downfield when he could have been sacked, and keep Alabama’s defense on the field with 3rd down conversion after 3rd down conversion. Hopefully, for Bama nation, Jeremy Pruitt sent a lot of game film to his former bosses last week. If you noticed he held up one finger when he pointed at the end of that. Thanks for the help Steve Austin. I’ll take Auburn 28-27 and that’s the bottom line because Stone Cold said so.